Description: the T-Rex stands in an aggressive posture, its head curved to the left and its arms outstretched as if attacking something. The tip of the tail is bent pointing upwards and to the left. It has small pads on its feet to give it extra support. It's mainly coloured dark blue, though on its top parts (neck, back, upper part of the tail) it gradually changes into a greyer tone. The belly and throat are coloured light grey instead. The Rex has black colouring around and in its mouth, as well as white teeth and tongue. It also has small yellow eyes (with black pupils) and a white JP logo on both upper legs. The Triceratops appears to stand in a brace-for-impact posture, its head (almost as big as its torso) held low to the ground (and slightly posed to its right), the front legs more or less in the same position, while the left upper leg is stretched backwards. The tail curves to the right. Its dominant colour is greyish green, which can be found anywhere on its body except for its underside (belly and throat) which is light grey instead. The figure is covered in various light brown and dark blue spots and shapes on its head and crest, back, flanks, upper legs and tail. Its parrot like beak, the three horns on its face and the two smaller horns on the cheeks are beige, while the Trike has small red eyes with white pupils. Its claws are not painted. It carries a white JP logo on each upper leg. Analysis: oh, my! A new sculpt! And totally out of the blue! Knowing Hasbro like we do, they sure as heck didn't create this new Triceratops specifically for this repaint line, so it must be a previously unreleased JP III sculpt that finally got a release after all. Better late than never! It's a nice little figure, and fits in decently with the other miniature dinosaur sculpts that originally came with human figures. Due to its plump body and oversized head it does have more of a hatchling feel to it though, but of course hatchling Ceratopsians wouldn't be this well endowed on their head just yet: the neck crest and horns are simply too big for a baby Trike. Its paint job is fairly good. More use could have been made of the crest, but at least this sculpt isn't as monochromatic as some of the earlier Ceratopsian sculpts thanks to the various brown and blue spots. The T-Rex however is a dismal failure. It has one of the most boring paint jobs ever conceived for a repaint. On first sight it even appears to be one single colour entirely. On second, this is not the case, but it's painfully obvious attention to details has been totally skipped. None of its claws are painted, and the facial features could have used a lot more work too. Maybe Hasbro made this particular repaint so crappy on purpose so the Triceratops got a better chance to shine. In a fight between the two, it would probably stake the Rex to death on those nasty horns. Good riddance! Repaint: yes and no. 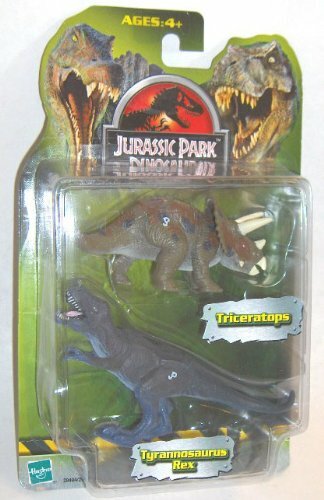 While the T-Rex originally came with the Military General for the JP III line, the Triceratops has not been seen before. It's most likely a left-over sculpt from JP III, but there's no proof to support this theory, or proof to the contrary. This is really a mysterious figure and though it seems unlikely Hasbro produced it especially for this repaint line, it does add a little welcome surprise and intrigue to an otherwise dull toy line. The T-Rex, already repainted for Camo-Xtreme and JPD2, would be featured again in both this toy line and JP 2009, as would the Trike be. Overall rating: 7/10. Finally a set that does include something new! The Triceratops is a decent figure, but despite the shock around its very existence it's otherwise nothing special. The T-Rex however gets increasingly boring the more often it's repainted and almost drags the level of interest of this set down entirely. Like most dinosaur two-packs from JPD2 and JPD3, this is one of the more common releases and it can still be found with little effort, usually for low prices because these two-packs are just not in high demand, even though this set does contain a new sculpt.